Sunday, Sunday, Sunday! 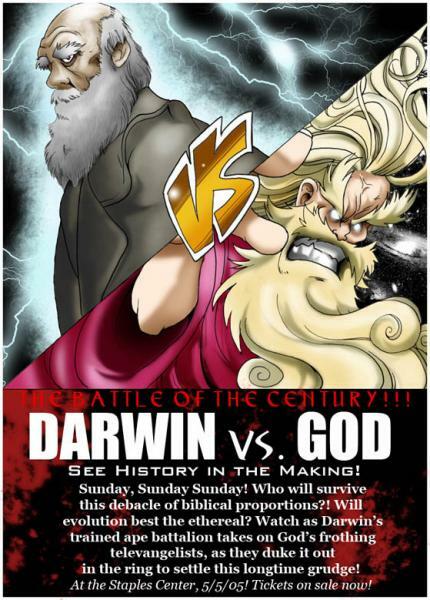 Who will survive this debacle of biblical proportions?! Will evolution best the ethereal?Ã‚Â Watch as Darwin’s trained ape battalion takes on God’s frothing televangelists, as they duke it out in the ring to settle this longtime grudge! I exist. Therefore god wins. I exist. Therefore natural selection wins. If there is a God why doesn’t he stop hiding and broadcast himself on TV? Quit screwin’ around and MAKE THE DAMNED MOVIE. You’re halfway there with the poster, now make it a Hollywood blockbuster! I’m serious!! !